Hello people of the internet!!! On today’s ‘Monday Memos’ we will be reviewing the book ‘You Before Anyone Else` by Julie Cross and Mark Perini. I was fortunate enough to receive an ARC of this amazing book earlier this year and am super excited to share this book with you! If you`re looking for a story with drama, heartbreak, love, and so much more, than this is the book for you. Are you already super excited? Yeah you are (just so you know, this will be a spoiler free review because y’all NEED this book in you life…like seriously you do)! Ok let’s jump into the review. Ready? Ok, lets go!!! ‘You Before Anyone Else’ is a YA romance which centers around teens Eddie and Finley as they navigate the difficult world of modeling in New York City. One night they meet at a party and thus begins an intense journey that will teach them both about love, sacrifice, and what it truly means to find happiness. 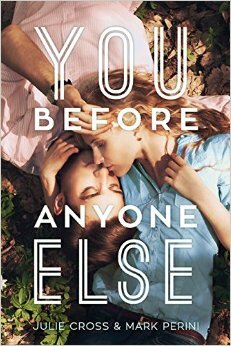 On the surface `You Before Anyone Else’ seems like a very basic and predictable YA romance novel. Finley, the good girl who knits in her spare time and helps her disabled father care for her younger brothers decides to shed her image by hooking up with “edgy, bad boy” Eddie and then moving on with her life. However, life has a way of wrecking plans, and once you begin to learn more about these characters you see that they both have deep, personal scars that cause them to always make decisions that are in the best interest of those around them, instead of figuring out what they actually want. ‘You Before Anyone Else’ is told in alternating points of view so we get a chance to see the story from both character`s perspective. This can be a very difficult storytelling devise however Cross and Perini pull this off perfectly. Honestly this story will make you laugh, cry, and instantly take you on a beautiful journey that you never want to end. I would definitely give this book a 4 out of 5 smiley faces and suggest that you pick up your copy now…as in this very second…the links are below, honestly what are you waiting for? All photos and information used in this blog belong to Julie Cross, Mark Perini, Sourcebooks Fire, juliecrossbooks.com, Twitter, Facebook, markperini.com, Instagram, netgallery.net, all companies, individuals, corporations, managers, writers, producers, authors, publishers, and/or businesses that should receive credit for any book(s), mentioned in this blog post, all of the and all companies, individuals, corporations, managers, writers, producers, and/or businesses that should receive credit for anything mentioned in this blog post, and all original owners. I do not own anything in this blog. If any people, corporations, businesses, companies, etc, were not previously given credit for their work, they are given credit now and their previous absence was unintentional. All opinions expressed in this blog are my own. I wrote this blog for entertainment purposes and no copyright infringement is intended. celindareyesblog December 14, 2016 No Comments on Monday Memos: You Before Anyone Else Review. Category: Book Reviews. Tagged: amazing, book, facebook, fiction, instagram, Julie Cross, juliecrossbooks.com, Mark Perini, markperini.com, netgallery.net, New adult, review, Sourcebooks Fire, twitter, YA, You Before Anyone Else, young adult.